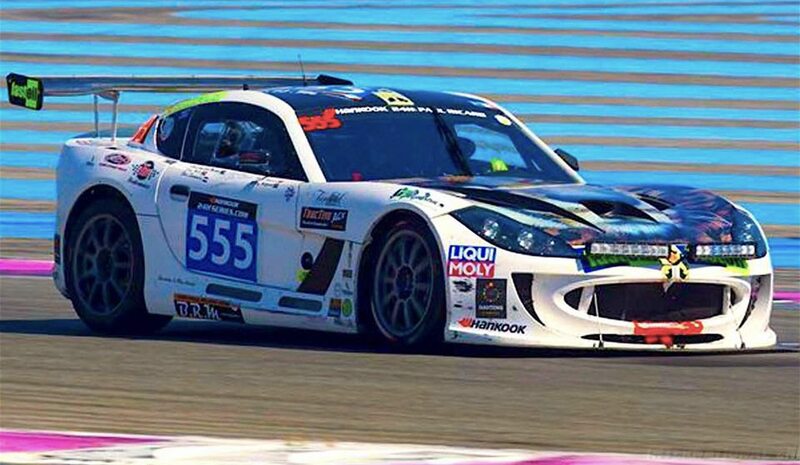 Team Africa Le Mans, 23 volunteers driving a Ginetta G55 race car with a cheetah emblazoned on the bonnet, headed to the Paul Ricard racetrack to take on a 24-hour endurance race, armed with little but guts and their cause. GREG MILLS was there. With faux leopard skin jackets and the large cheetah emblazoned on the bonnet of our Ginetta G55 racecar to highlight Motorsport SA’s anti-poaching cause, we, similarly, “talked African”. And, largely, we were. Gathered in the paddock of the Paul Ricard race-track in the south of France on the weekend of 16-17 July 2016 were seventeen South Africans, two Kenyans, three Brits and a Dutchman making up Team Africa Le Mans. Out of solidarity with our home base, we carried decals for the Gauteng Growth and Development Agency. Photo: Team Africa Le Mans and the Ginetta G55. The Jamaican analogy does not end there. What could a team made up of unpaid volunteers hope to achieve against the mega-budget professional European outfits in one of the toughest motorsport tests of all – a 24-hour Creventic endurance race? Photo: The Oswaldwhistle express nestles between those of the opposition. Looking around the pits, we were up against it. Swallowed up between giant pantechnicons and Meet the Fockers-type mega-budget RVs was our humble Renault tow-van with 255,000 miles on the clock and our three-berth Transit motorhome hired from Oswaldwhistle in England’s north, both schlepped in convoy south over 1,500-kms from Leeds where the Ford Mustang-powered Ginetta had been prepared, onto the Dover-Calais ferry to Ricard at speeds which necessitated a two-day journey. Planes, ferries and motorhomes: John Candy would have been proud. Photos: The old school of motorsport logistics. As 50 of the 51 teams set to wheeling out shiny alloy flight cases and erecting marquees, hospitality suites, kitchens, high-tech all-weather pit-wall boxes and, even, in one instance, a portable swimming pool, we unpacked our two tools chests and plastic stack boxes, unfolded our canvas chairs and set-up our bush awning on the wall. Sharing a pit with a multi-million Mercedes AMG GT3 routinely rammed the David and Goliath point home. Over the course of the 24 hours they used 20 sets of tyres to our four. Motorsport has, like much else, changed enormously since the 1960s, the days when drivers towed their own vehicles across the continent, from event to event, sleeping in tents or on the backseat of the tow vehicle. This era is now, on reflection, known as the sports ‘golden age’, when talent, energy and ambition together counted for more than money. It would have been easier, personally speaking, to raise the money to ‘buy’ a drive with one of the professional teams in this race. The quoted rate for seat among four drivers in a top car is some €50,000 for a 24-hour. But the personal point was not another tick on the bucket list. One to prove that even the higher echelons of motorsport are, in today’s hyper-technological and moneyed era, still accessible given, as Sarel van der Merwe put it in his inimitable way, “sufficient brains and balls”. We knew we had a fast and reliable car. This had already been proven by our performance and podium in the South African nine-hour event at Cape Town’s Killarney in December involving a nucleus of the Ricard team, led by Lammers and his old sparring partner, the legendary Sarel van der Merwe, multiple SA champion and winner of the Daytona 24-hour. Photo: Anton Roux, Nick Adcock, Greg Mills, Jan Lammers and Supervan. While our engineering team may not have had a world-beating budget, it was undeniably world-class. Kenyan resident Nic Jooste has a rich and varied CV in racing fabrication and preparation from South Africa to Dubai, Australia and Germany. Countryman David Horsey had won the African rally championship in a self-built Peugeot bakkie during the hyper-fast 1980’s Group B years. And there were mechanics, machinists, fabricators and other techies from Uitenhage, Jozi, Pretoria, Durban, and even Pringle Bay, an orchestra of talents under the baton of Anton Roux, until recently the Africa head of one of the big-two global reinsurers. “Don’t come home unless you finish” was my partner’s advice on leaving home for Leeds 10 days earlier. Endurance racing involves a balance between pace and consistency, drivers with the experience and skill to push hard and sit back at the right moments, a continuous tension between intellect and instinct. An element of luck is required. Le Mans this year was a reminder how suddenly and unexpectedly things can go badly wrong, the leading car dropping out in the last lap, the images of the mortified Toyota pit replayed world-wide, etching that lesson. After a practice studded with wheel and lighting dramas, we lined up on a grid, the start memorable for the wrong reasons: the minute-long silence and singing of La Marseillaise in respect to the victims of the Nice terror attack. Jan kicked off the driving at 14h30 on the Sunday, placing the car in 39th position at the end of his 100-minute stint. It was baking hot inside, necessitating a change of plan on the in-car ventilation and drinking bottle system. After Jan followed stints by Cape Town’s Nick Adcock and Terry Wilford before the difficult sunset session. By nightfall, Supervan had taken responsibility behind the wheel, ticking off laps with metronomic consistency. By my second driving stretch at sunrise, I had to remind myself that we still had nine hours to go. Although it was uncomfortably hot, and some of the driving ragged by this point, the laps quickly ticked over. Soon it was the final session. Although Jan was scheduled to be driving, between us we conspired it was right and proper for Sarel to do so; what he said, poignantly, would be ‘the last international flag of [his] career”. An épique end, then, to a grand career. Photo: The last pit stop, Sarel van der Merwe takes over for the final flag. And when it finally did drop on Sunday afternoon it was greeted with a sense less of delight than immense relief. I could, at least, risk returning home. As we stood waiting for our turn on the podium to receive the third place class trophy, Jan commented how much this has been ‘a simply remarkable effort. The car was obviously prepared very well, and did not miss a beat. It was also great to support the stop poaching campaign, a fantastic cause, received here with great sympathy. The grandson of the pre-war GP driver Billy Mills, Dr Mills drove with Team Africa Le Mans at Killarney and Paul Ricard. Main photo: Team Africa Le Mans, Ginetta G55.